No table is complete for Halloween without a candy corn centrepiece. These great décor items are super easy to make and look great on any table. 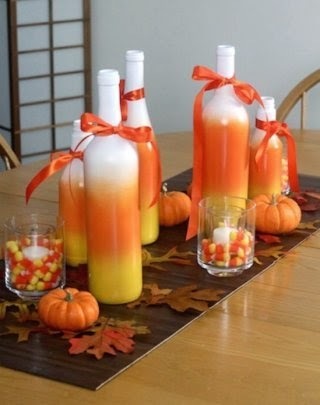 You just basically have to spray paint the candy corn colors onto old glass bottles and then decorate however you want. This is a great project to keep for next year. You can make one or several and create a beautiful display. Don’t forget to add a little real candy corn though, just because it’s so yummy. Paint the bottles in the color of Candy Cane. Starting from bottom move upwards. Let the paint dry. After when its completely dried add some ribbons on the neck of the bottle and your beautiful centerpiece is ready.